Welcome to our store! 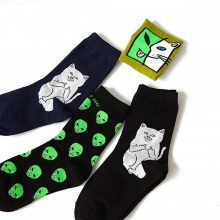 We offer a wide range of memes themed clothes and accessories! Complete your image with original cap! Discover our great selection of unusual T-shirts! Welcome to Memes Store where you will find various unique merchandise related to best memes! What kind of fan wouldn’t want to acquire a few souvenirs designed after his or her favorite meme! Our online shop is a perfect place to buy costumes for special parties, collectibles and posters for decoration, and of course casual clothes with the images of memes. Memes Store will become the source of treasures for people who want to express yourself and be different from other people. Do you love memes and have fun? Do you want to find funny and creative products? Our online store can provide you with a variety of outfits, clothes, accessories, toys, and lost of other products. Choose from more than 200 products. Always wanted to get a t-shirt with your favorite meme? Or maybe wanted to piss off somebody with your outrages outfit? Have a particular political or religious view and want to show them for everyone. It’s up to you to now. The wide variety of goods such as t-shirts, hoodies, phone cases, backpacks, accessories and so on. It can please any Memes fan. In our store, you can find the pepe, grumpy cat, comic faces, dog memes and so on. Fill your room with familiar faces, scenes, and words. The outfits we offer are indispensable if you want to have a costume party. The astonishing resemblance between our products and the original makes them perfect for everyone. If you want to amaze your friends with your gift, we would be glad to help. Take the advantage of using our online shop. A few clicks and you will avoid a whole bunch of trouble. You won’t have to go to a crowded mall or look for the thing you want running from one store to another. Whether you need a single item or a set for yourself and your friends, we protect your purchase from the very first click to delivery. Our online shop welcomes you!